We have plenty of great holiday events taking place throughout this month and the beginning of next year, sure to entertain anyone who attends! Whether you prefer strolling through the gardens, experiencing a play, or watching some live music, these local events are the perfect excuse for a night out. Garden Lights, the third annual extravaganza featuring a million lights, sparkles with new imagination! Several colorful figures from Imaginary Worlds: Plants Larger Than Life join the magical holiday fun. Earth Goddess transforms into Ice Goddess – a vision of wintry radiance with twinkling lights weaving through her tresses. Red and white stripes turn the towering Cobras into hypnotic Candy Cane Cobras. Jim and Della are out of work and penniless during Christmas in New York. To afford presents for each other, both secretly part with their most precious possessions. In O. Henry’s classic holiday story, the two lovers’ gesture of giving creates a warm and intimate Christmas in the cold, unfriendly city. Set to the music of Randy Courts, this charming and transcendent musical will kindle the holiday spirit in the heart of Atlanta. Christmas at The Classic Center will be a fun filled wonderland for all ages benefitting Extra Special People. Come out to enjoy a range of activities from ice skating to visits with Santa, you don’t want to miss this magical event! This one night only concert from Star 94 features the Backstreet Boys, the Goo Goo Dolls, Avril Lavigne, the Fray, and Colbie Caillat. Tickets are $60 for concourse level, $50 for floor level. Eddie’s Attics brings a wonderful selection of songwriters this holiday season, featuring Ryan Horne, Micha Dalton, Nathan Angelo, and Jonathan Rich. Tickets $12 in advance, $16 at the door. In its 6th year returning to The EARL, for two nights on December 20th and 21st, Jeffrey Bützer and T.T. Mahony with Robby Handley will perform Guaraldi’s score to A Charlie Brown Christmas with a spirit only fitting of Charlie Brown himself. Get out of your cramped house for an evening with local favorite and Eddies Attic mainstay Mike Willis. This year Willis brings an onslaught of his uber-talented friends from the Atlanta area and from across the country for a one-of-a-kind show! Tickets $10 in advance, $15 at the door. With music best described as soulful rhythm and blues, Zach Deputy demonstrates his extraordinary ability to perform and record in multiple contexts and conveys the sensibilities of a mature singer/songwriter. Georgia’s very own the Black Lips are known for their special blend of punk, raw energy, and stage antics. Their show at the Drunken Unicorn is one that both fans and newcomers alike will remember as a show that stands out among others. Enjoy entertainment and drink specials at the best place on Memphis’ Beale street to ring in the New Year and see the Guitar Drop! The New Year’s Eve Party on Church Street is downtown Orlando’s best tradition. It’s the only party with the world famous Orange Drop from 120 feet in the sky. Ticketing and drink packages from $39. TA Live Weekend Picks: Alabama Shakes, Atlanta Strong Beer Festival, & More! 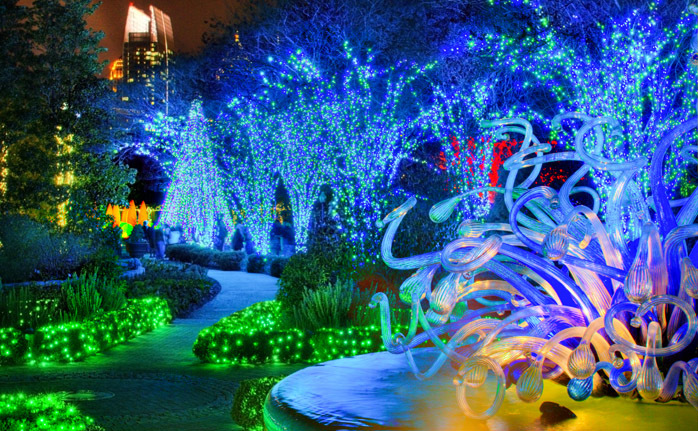 Holiday Gift Ideas: Atlanta Botanical Garden Memberships, TA Gift Cards + More!